We'll see you at these food stops! 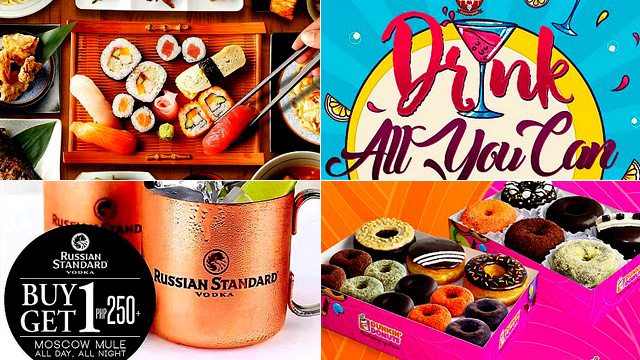 (SPOT.ph) Get ready for a round of drinks for this week's Cheap Eats! Take your pick between unlimited mojitos and rhum coke, and two-for-one vodka. Plus, we've found deals on doughnuts, ramen, banh mi, and more. Chocoholics, get your chocolate fix with the new Chocollection bundle from Dunkin’ Donuts! For only P299, you get six Premium chocolate doughnuts, three Classic chocolate doughnuts, and a 10-piece Obsession Sampler or 10 sticks of Dunkin’ Yan. Promo runs until January 31. See a list of Dunkin' Donuts branches. For more information, log on to Dunkin' Donuts' Facebook page. Can’t get enough of your favorite Cream Cheese Stix from Auntie Anne’s? There’s a lot more to go around with this promo! 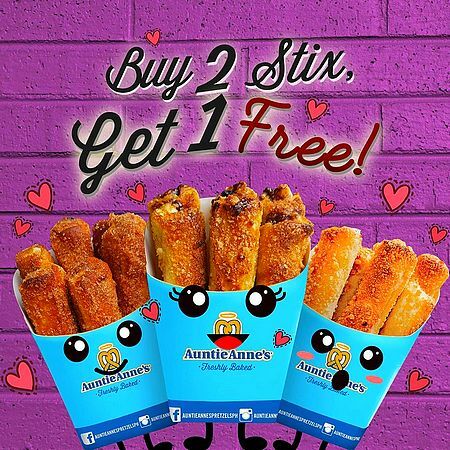 Buy two orders of the Cream Cheese Stix and get another one for free. This promo is available at selected branches only. See a list of participating Auntie Anne's branches. For more information, log on to Auntie Anne’s Facebook page. 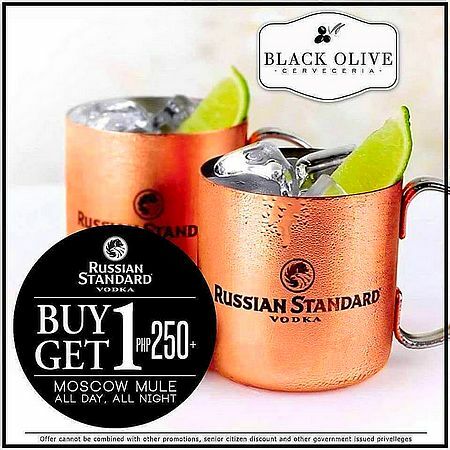 The Moscow Mule at Black Olive uses Russian Standard Vodka with a dash of Stella Artois and fresh fruit garnish. Yum! 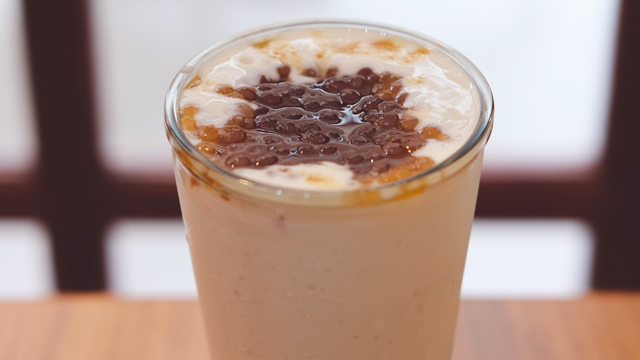 Order one for P250 and get another for free. It’s available all day and all night long! Here’s a treat from Ramen Shokudo: In one hour, enjoy unlimited servings of Toriton Shio, Toriton Shoyu, Toriton Miso, and Toriton Tan-Tan for just P380. Hurry, this promo runs until tomorrow only! 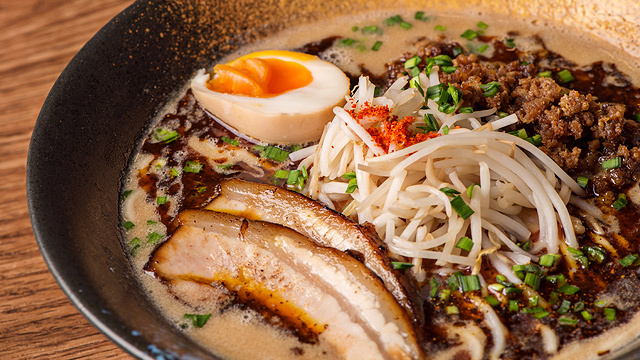 Ramen Shokudo is at 401 Banawe Avenue, Quezon City. 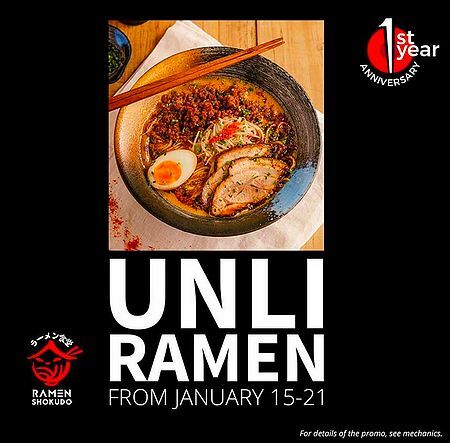 For more information, log on to Ramen Shokudo's Facebook page. 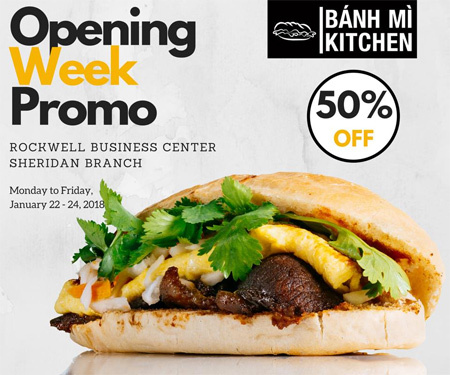 Banh Mi Kitchen is opening their newest branch at Rockwell Business Center on Sheridan Street, Mandaluyong, and they're celebrating with a special promo! Get 50% off on any Traditional and BMKN Creations from January 22 to 24. 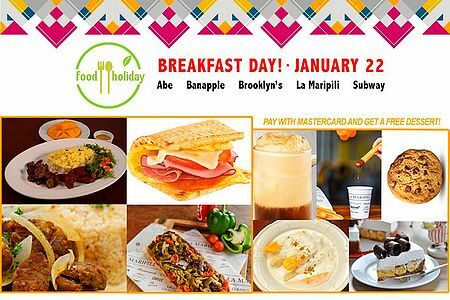 This promo is only available at Banh Mi Kitchen, Rockwell Business Center, Sheridan Street corner United Street, Mandaluyong City. For more information, log on to Banh Mi Kitchen's Facebook page. Alabang Town Center is at Alabang-Zapote Road corner Madrigal and Commerce Avenues, Alabang, Muntinlupa City. For more information, log on to Alabang Town Center’s Facebook page. 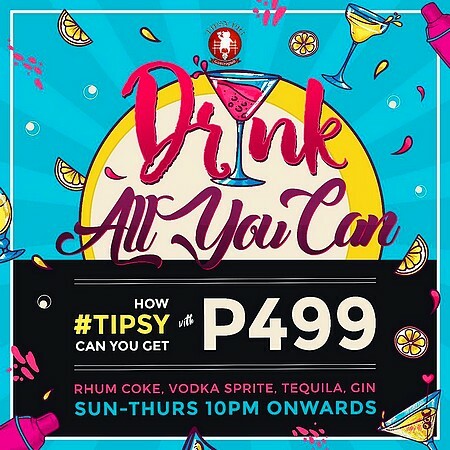 How tipsy can you get with P499? Find out at Tipsy Pig! Bring your friends and take advantage of the bar’s drink-all-you-can promo. Celebrate the night away over Rhum Coke, Vodka Sprite, tequila, or gin. This promo is valid only in the Capitol Commons branch from Sunday to Thursday, 10 p.m. onwards. Tipsy Pig is at Capitol Commons, Meralco Avenue corner Shaw Boulevard, Oranbo, Pasig City. For more information, log on to Tipsy Pig's Instagram page. Head on over to Ginzadon at Resorts World Manila, and have your fill of everything in the special Eat-All-You-Can menu! 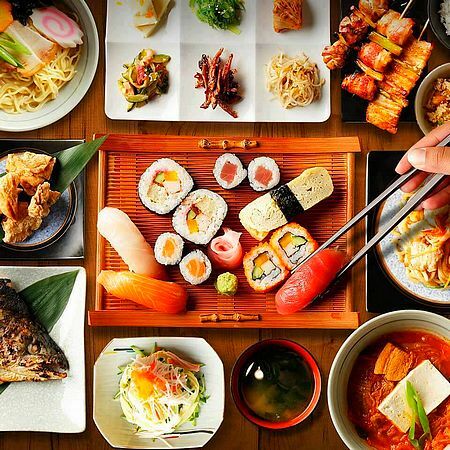 Start off your meal with fresh cuts of tuna, salmon, snapper, and other types of sushi. Then, dig into a serving of fragrant japchae or rich soy-bean stew. Get all of these and more for just P888. Ginzadon is at 2/F The Newport Mall, Newport Boulevard, Resorts World Manila, Pasay City. For more information, log on to Resorts World Manila's Facebook page. This one’s sure to fit right into your budget! 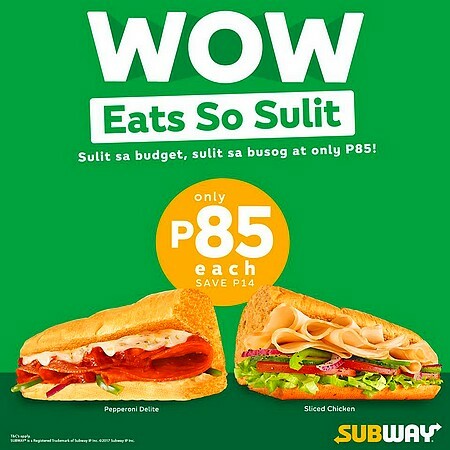 Head over to the nearest Subway branch and get yourself the six-inch Pepperoni Delite or Sliced Chicken for just P85. It’s available for dine-in and take-out at selected branches until April 11. Try something different for your next wine night. 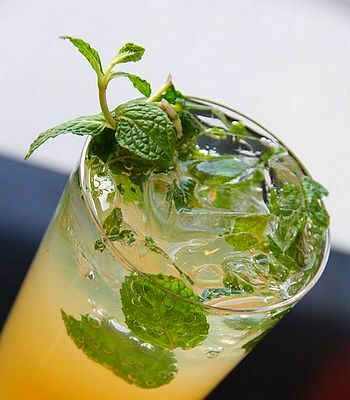 Head over to Refinery and sip on unlimited sparkling wine mojitos for just P690. It’s available every day, starting at 5 p.m., until January 31. Refinery is at G/F Joya Lofts and Towers, Rockwell, Makati City; and G/F Promenade Mall, Greenhills Shopping Center, San Juan City. For more information, log on to Refinery’s Facebook page.